Crown and BSS Audio partnered on an AVB demo at the close of last year that built and tested a system with BLU805s and 30 Crown DCi amps networked with AVB. Promotion for this year’s NAMM Show, to take place January 23-26 at the Anaheim Convention Center in Anaheim, CA, emphasizes education and increasing your business smarts. Meanwhile, the marketing theme for the event is “Amplify: Turn Up the Volume on Your Sales”. So, perhaps now is the time to talk about smarts where they pertain to amplifiers, many examples of which will be on display at NAMM, and may potentially lead the conversation on the pro audio installation side of the business at the show. Announcements in the amplifiers category over the course of 2013 definitely were of a smart nature, both in terms of feature sets and networking prowess. These amps aren’t just adding a few processing options, they’ve been redesigned from the ground up to alleviate the fundamental trouble spots of heat dissipation, hardware weight and rack real estate, and distortion. This conformity to the universal technology trend of shrinking products with growing capabilities is also coincident with the trend of amplifiers becoming a network node, or indeed possibly a central component of some system designs. These two trends are happening concurrently for a reason, according to Marc Kellom, senior director of engineering and marketing at Crown by Harman, where smart amplifiers benefit from more than a decade of R&D and product launches at this point. “If all you do is bolt a DSP on the front of an amp, you get a lot of extra features, but you also add a lot of complexity,” Kellom explained. “Now designs have trended in the direction of simplify, simplify. That gets you more efficient, smaller, and better performance without adding all the complexity that becomes a reliability question.” More parts mean more potential to fail, so new designs reduce component quantities to boost reliability. In terms of specifics, Kellom pointed to the three microcontrollers built into the spacious, airy chassis of Crown’s new DCi Series. Where only a couple of years ago, circuitry was spread across many components, the new designs at Crown take advantage of the flexibility and reliability inherent in microcontrollers. On the reliability front, Kellom points to the microcontrollers inherent in the XLS DriveCore product series, which has not so much as required a single firmware update since its launch. Further, the fact that microcontrollers were employed in that particular entry-level product line proves that they offer manufacturing cost advantages as well. QSC’s CXD Series of processing amplifiers Kellom again points to robustness as a touchstone when it comes to media networking. The Harman mantra there is to enable compatibility with all the popular flavors, but when it comes to networking in large-scale applications, the company has a focus on AVB. Crown and BSS Audio partnered on an AVB demo at the close of last year that built and tested a system with BLU805s and 30 Crown DCi amps networked with AVB. The experiment went well enough for the team to give up a portion of their Thanksgiving weekend for the endeavor. Adding media networking to amplifiers provides a lot of benefits to designers and can reduce cost, improve performance, and provide additional flexibility in how the system is designed, indicated Ethan Wetzell, platform strategist for Bosch. That manufacturer has added the Electro-Voice RCM-28 OMNEO network and DSP module to its lineup, expanding the reach of its amplifiers into a broader ecosystem. This “allows ever further integration of the amplifiers with other applications and product segments such as intercom, public address, and conferencing,” Wetzell said. Decentralization allows users to place audio processing precisely where they need it, a strength that Lab.gruppen made a key aspect of its Lucia launch at InfoComm last year. Fitting well within the “smaller, faster, better” category, Lucia is all about installation efficiency and simplified configuration. 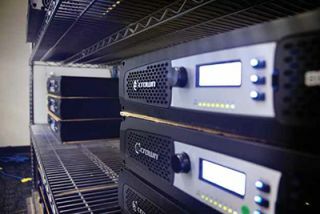 The Lab.gruppen LUCIA (Localized Utility Compact Intelligence Amplifization) amplifier Smart amplifiers have also studied up on loudspeaker tunings, and in that category, QSC offers some 80-odd profiles built-in to the library of its new CXD series processing amplifiers. Integrators can download and apply their favorites and the amp will receive the processing necessary to manage those loudspeakers. Visitors to NAMM will be able to catch a glimpse of the CXD series, but the big news for these QSC products will be presented at the Integrated Systems Europe (ISE) show February 4-6 in Amsterdam. That show will feature the triumphant arrival of the much-anticipated Q-SYS networked CXD-Q amplifiers. Customer demand has been significant for the CXD-Q evolution, according to Dale Sandberg, senior product manager for QSC, especially because audio transport is at the front of so many people’s minds at the moment.